Tsukuba International School provided some entertainment at the Tsukuba International Exchange Fair on Sunday, May 11, 2008. With the help of “Amigos de TIS”, the students performed the Do Re Mi song from the Sound of Music. The audience joined in the fun and sang along to the children’s actions. 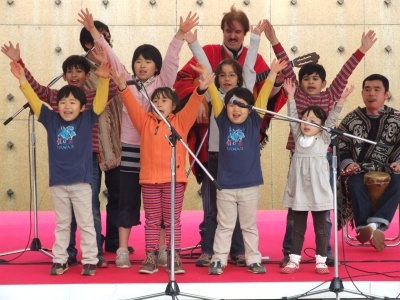 Amigos de TIS is comprised of Luis Sartor, who hails from Argentina, Junichi Tanaka, a music teacher at Meikei High School, and Akehide Yoguchi, a former student of Meikei. In addition to accompanying the kids’ performance, the band played a collection of Latin American favourites that got the audience clapping and singing along, warming up the crowd nicely for the performers that followed.